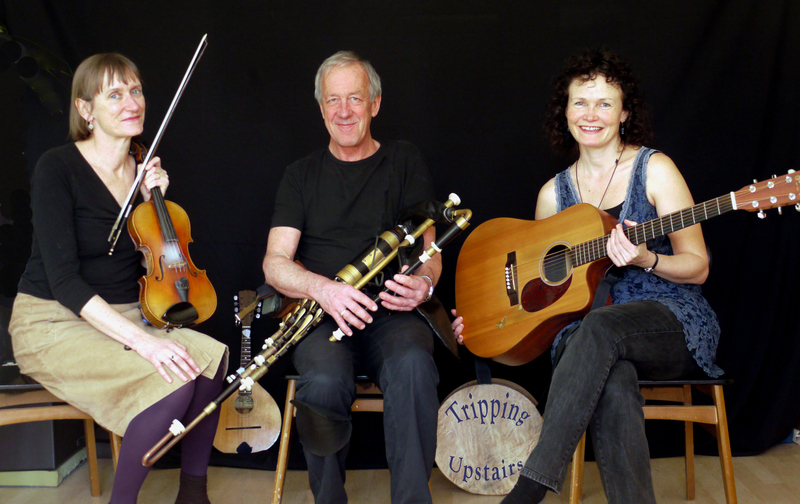 • ‘Tripping Upstairs’ are an Irish/ Celtic band based in Sussex. We play Irish and Scottish airs, jigs, reels and hornpipes alongside a broad repertoire of traditional and contemporary songs. • Jo Chedgey (vocals, guitar, bodhran) sings and captivates audiences with her voice and presence; she performs in English and Irish. See www.jochedgey.com. • Sue Johnston (fiddle, vocals) has a strong and lively instrumental style, providing a mellow accompaniment to Jo’s songs and blending beautifully with the pipes. • Will Flewett (uilleann pipes, mandolin, whistles). • We can be booked for Weddings, Ceilidhs, Wakes and Corporate Entertainment. • We can guarantee to get you and your guests on your feet, toes tapping, waltzing and jigging. We guarantee a good ‘craic’, lots of smiles, laughter and an evening to remember! • We play acoustically and have a PA system suitable for any venue, depending entirely on your requirements.